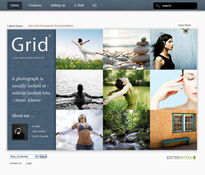 If you liked the very first theme I remember getting launched with a Grid title from JoomlaBamboo then you are going to love this new one from them - it's like the grown up, but not really old enough older brother or sister. The theme is basically a portfolio theme or a simple blogging theme for Joomla - they've also included a theme for K2 so you do have everything. In fact, with Joomla, this theme and a theme for K2 you are over half way to having a very nice looking site. You just need to spend time adding content and getting everything else on it. Job done. It also comes with "20 immaculate themes full of texture, colour and finesse" so if you thought it would be too much work, don't worry - you'll find what you need right under the hood.